Since its inception in 1978, Kody Medical Electronics has steadily grown to become a leading supplier of vascular dopplers, surgical dopplers, foot scanners and other various kinds of originally designed medical equipment by the KODYS R&D team like Sensitomer – VPT .We specialize in equipments related to diabetic foot care and neuropathy, foot surgery, cardiac surgery, plastic surgery, neuro, uro and ortho surgery along with a wide range of vascular dopplers. With decades of experience and knowledge we continue to be the leader in innovation and technology in the industry Since our inception, KODYS takes pride in delivering innovative products with unmatched levels of personalised service. For over 40 years we are driven with one goal in mind – to provide innovative, high quality products through our valued customers that enable patients to live healthier, more comfortable and independent lives. 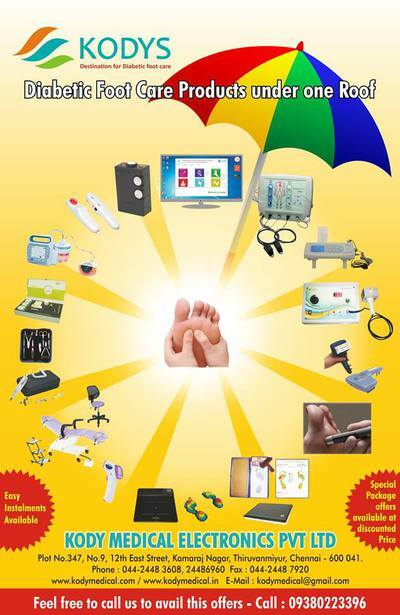 You can check our entire product range on our websitewww.kodymedical.com or you can get in touch with us on 91-9380223396. We are available 24/7 to assist you with all your needs.